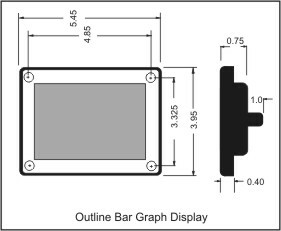 The Auto Charge Deluxe Watertight Status Center, is a remotely mounted, digital voltage and amperes display, a 5 segment bar graph display to indicate output current, and 4 LED's to show the condition of the batteries. The High and Low Battery Condition LED's blink to indicate that there may be a problem with the vehicles electrical system. 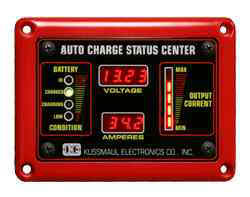 This indicator is an option for the Auto Charge 1000, Pump Plus 1000, Auto Charge 1200, Auto Charge 1200 Remote, Pump Plus 1200, LPC 20, LPC 40 and LPC 80. Please specify which charger when ordering.